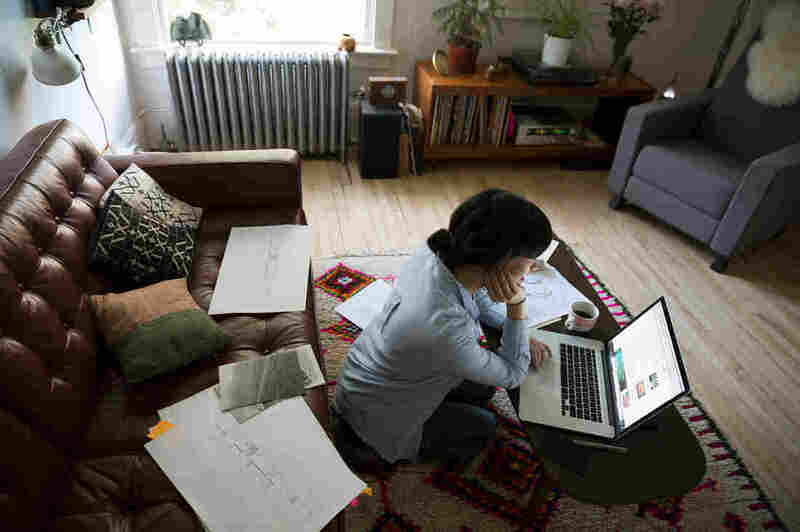 'Gig Economy' Workers Push For Employee-Style Benefits : Shots - Health News The vast majority of the estimated 54 million to 68 million contingent or independent workers in the U.S. don't receive employee benefits, though some firms and lawmakers are trying to change that. The vast majority of contingent or independent workers in the U.S. do not receive employee benefits, though some companies and lawmakers are trying to change that. But, Teran says, he didn't want to run a business with the kind of very high client and employee turnover that can run as high as 400 percent in his industries. "In order to deliver the best service we need the best people, and to attract and retain the best people we need to be the best employer," he says. A growing number of Americans rely on gigs for income — driving a car, writing bits of code, or doing tasks for hire on a project-by-project basis, and this kind of contingent work is spreading to more industries as well. The vast majority of the estimated 54 million to 68 million contingent or independent workers in the U.S. do not receive employee benefits, though some companies and lawmakers are trying to change that. Lawmakers in Congress and at least four states are considering proposals aimed at funding and creating new systems to deliver benefits to contingent or contract workers. Sen. Mark Warner, D-Va., last month proposed a bill to fund experimentation with portable benefits programs — ones that travel with the individual, regardless of where they work. "We need to rethink the social contract for the 21st century; that social contract has to be updated to a much more portable form," he says. As contract work goes mainstream, companies are looking to perks to get better work out of their contract workers, says Ravin Jesuthasan, managing director and talent expert at Willis Towers Watson. "It's very difficult to motivate that person to go above and beyond and to feel committed to your mission and cause, so that's a key part of it," he says. "How do we ensure we're attracting the very best, we're engaging them, and we're equipping them to represent the best of who we are?" The biggest reason most companies do not offer their gig workers benefits: They don't want to have them categorized as "employees." Under the law, employees have more rights than independent contractors — for benefits, to unionize, and other worker protections. With the growth of contingent work, that legal distinction between employee and contractor blurs, and courts and regulators are now wrestling with questions of classification and worker rights. Rich Meneghello is a Portland, Ore., lawyer who represents employers. "There's a real solid concern that if they offer benefits packages towards their workers that these workers would then be classified as employees," he says. As gig work grows, this debate will intensify, and the question of benefits for these workers will take on more importance, says Sara Horowitz, executive director of the Freelancers Union, which representing 360,000 members. "I think we also want to start imagining the next era of a safety net, where people can do the work they enjoy and need to do, and can get the benefits that they need," she says. Stride Health, a San Francisco firm, has built software that allows independent workers who can afford it, to buy health care and financial benefits on their own. Noah Lang, Stride's CEO, says he's hoping to capitalize on the growing demand, and be ready for when public policy shifts. "Where we're driving change is going ahead and building up the systems to allow independent workers to get on equal footing," he says. He says he hopes Stride can offer a model for how more companies can get the flexibility of working with contingent workers, with the security of receiving benefits.